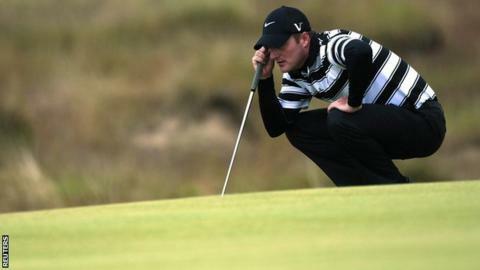 Three Scots are very much in contention at the Scottish Open after a day of low scoring at Castle Stuart. Trailing leader Francesco Molinari by only two shots is Marc Warren, who carded a third-round 64 to leave him on 15 under. He described the round as one of his "most stress-free days". Martin Laird and Peter Whiteford are one shot further back after rounds of 64 and 66 respectively. The course and the weather, especially earlier in the day, were in forgiving mood as several players took their combined under par tally into double figures. Such were the low scores being posted that the player propping up the 77-man leaderboard - Spain's Miguel Angel Jimenez - is on level par. Denmark's Anders Hansen, on 16 under, stands between Warren and Molinari, and Hansen's countryman Soren Kjeldsen will also fancy his chances of lifting the trophy at the Inverness course as he is tied with the Scot. "That was great today, seeing my name on the board and just trying to get as high as I can," said Warren. "It's nice to have a few Scots up there." US-based Glaswegian Laird is also delighted to be within striking distance. "I did exactly what I needed to to get myself back in the mix here," said the 29-year-old. "My goal was to shoot a low one; I did that and I am happy. "I'm right there and hopefully I can go out and play well again tomorrow." Prior to the first round he had spoken of the thrill of playing in front of his family, who had journeyed up the A9 to cheer him on around the links course. And he was also grateful to the local fans for their support. He added: "It was great. It seemed like every birdie I made I picked up a few more people and it was great to hear them willing you on." Laird and Whiteford predict that the winner will be on a score of at least 20 under on Sunday. "I need at least another 66 to even have a chance," claimed Whiteford. "But the way the season has gone, if I can just get a top-five finish out of this tournament, that would be the number one goal." That would represent a significant improvement for Whiteford. Before the first ball was hit at the Scottish Open, he had missed the cut in 10 out of 16 tournaments in 2012 and is a lowly 148th in the Race to Dubai placings. Four other Scots were in action. Stephen Gallacher's 65 leaves him on 11 under, Alastair Forsyth scored 68 to put him on nine under, teenage amateur Jack McDonald is one shot further back after a 68 and Steven O'Hara is on seven under after his round of 69.